As you’ll note in the comments below, users speculate this is due to the signals from both of the iPhone antennas being interrupted by one another. Apparently the reception difficulties are exacerbated by moist or sweaty hands, so if you have sweaty hands and you are holding the lower left corner of the iPhone in such a way that the black antenna bands are covered/connected, you are more likely to see reception problems. Apple’s other suggestion of buying a case to remedy the problem has frustrated some iPhone owners. Many user reports indicate that Apple’s official bumper cases work wonderfully to halt all the reception difficulties, but there’s practically unlimited cases out there for iPhone’s so finding one certainly won’t be difficult. It’s very important to note that not all iPhone 4 users are effected, as you can see in the videos posted yesterday about the iPhone 4 reception problems, many people can replicate the exact handling and have no issue at all. 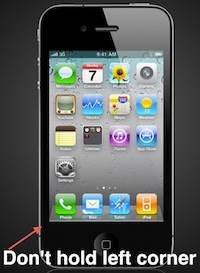 iPhone 4 Reception Problems: Dropped Bars & Calls if Antenna Touched? In my state we have a hands free law, maybe Apple is just helping us obey the law by making reception work best hands-free! err the black lines are not the antenna’s! the entire side is an antenna, the black line is where the different antenna is separated. my guess is that by by effectively joining the two with your hand, signal is disrupted! Joe’s right, didn’t you guys watch the WWDC? Steve said the metal strips form two different antennas, 3G and Wi-Fi. The black band is the insulation between them. If you cover that and form a connection with your hands, they start cross-talking and disrupting each other’s signals. OS X Daily, biased as usual. Well. I cancel my subscription. Haha. What a joke! Spend all the money for a piece of crap. Reception Fix?? I don’t think so. I havent had a chance to try it yet, but anyone tried turning off the wifi/bluetooth then trying the “deathgrip”? Black strip = antenna…. How retarded can you get? Of course the *metal* left and right of the strip is the antenna dumbsh&t! If you touch both parts of the antennas with sweaty hands you change the frequency characteristics of the antenna by enlarging the conductive area. When looking at the phone…the LEFT side antenna is for the WIFI, Bluetooth. The RIGHT side it for the signal. While holding your creating a bridge between the 2 antenna’s…causing the low to no reception. I just purchased a rubber cover to protect the phone and now I have full bars while holding the phone. Not quite a fix for Apple’s mistake, but it’s a work around. I never use cases or screen covers on my iPhone unless it’s an extended battery case and I’ll be away from a charger too long. Part of the iPhone’s appeal is it’s physical appearance – now I have to cover the thing up in an ugly plastic case to get it to function? Lame, Apple, lame. Scotch Tape will fix the issue..
An easy way to effectively correct the problem is to paint the whole metal strip with transparent nail paint (nail varnish/polish), if you paint it carefully and with care, you get a very nice glossy finish and very very thin (paint carefully by putting your phone vertically and painting strip by strip from the top to down, do not cover the same area more than 1 time, paint slowly but in a single run for best result). This is a solution that is often used on integrated circuits for insulation. There will be however a signal disruption (radio propagation theory will help you) if you grip it, but, both antenas will not interfere because of conductivity anymore. If you feel it doesnt do the work you wanted, you can easily remove it with nail polish remover, again carefully and slowly. Done it on mine, works perfectly, and you dont even see it. You can however feel that theres a different texture, but it is not unpleasant, just a little bit different, if you can afford to buy 4-5 packs of that nail varnish you can pour it on a plastic vase and dip your phone side into it, but i woudnt recomend it because if you fail and let your phone drop or something it can have some nasty results. i have replaced my iphone 4 screen but now all that comes up is lines can anyone help?